Most familiar as a common garden plant of herbaceous borders, and available from seedsmen in many colour forms, but the plant has also been naturalised for at least two centuries on the old town walls of Carrickfergus, where it always has red flowers (the wild-type coloration). Occasionally it is also found established on old walls elsewhere. 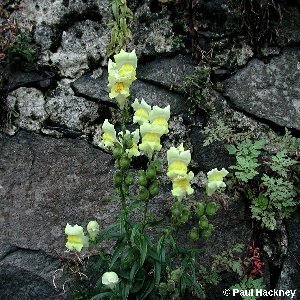 The plant is native to southern Europe and the wild populations of Ireland are of garden origin. 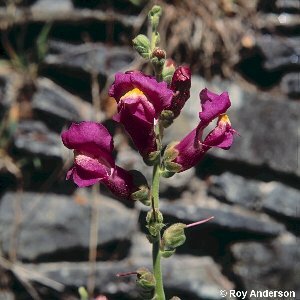 Wallflower and wall pellitory are other established aliens of old mortared stone walls which frequently accompany snapdragon. 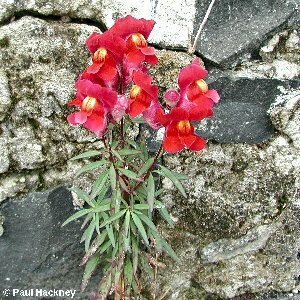 All names: Antirrhinum majus L.